Home » Hungary » Eger Doboter Cam - Hungary. Eger Doboter Cam - Hungary. 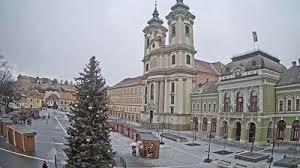 Eger Doboter webcam is located at the centre of Eger (often called: the Baroque Pearl of Europe. Dobo is the main square of the historical town, surrounded by Baroque houses and St. Anthony's Church. Other historic buildings nearby include the Cathedral and the Lyceum.